This product was developed by Ethan Peck, 2008 Hollings Scholar from Cornell University,and his summer program mentor Daniel Wilkinson with the National Centers for Environmental Information (NCEI).The product was first announced to the user community in a poster presented at the 2008 Fall Agu meeting in San Francisco, CA. Paper # U13A-0048 was included in the session titled " The Van Allen Radiation Belts and Their Impact on Modern Space Science"
View the poster here (5MB pdf version 8). 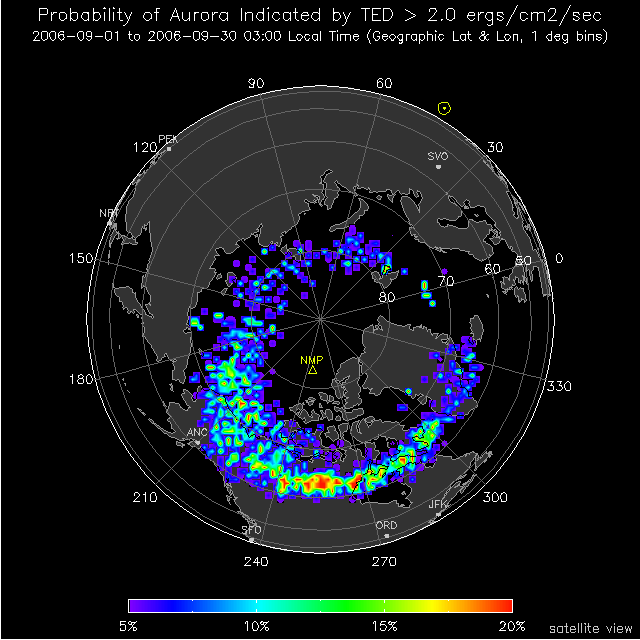 NOAA’s Polar Orbiting Environmental Satellites (POES) monitor the energetic particle environment along their orbit paths -- nominally 850 KM altitude, 98 degree inclination and a 100 minute period. Bi-directional detector telescopes provide energetic particle measurements along the zenith (0°) and the horizon (90°). 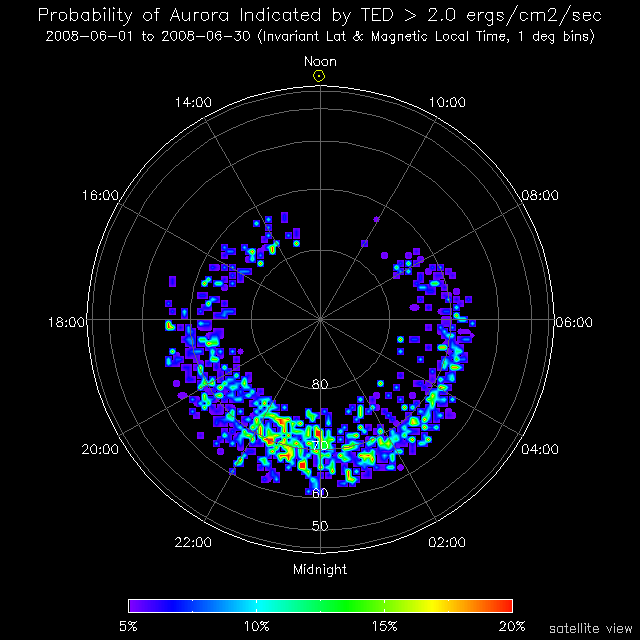 POES data are downloaded once per orbit and delivered to the Space Weather Prediction Center (SWPC) in Boulder, CO where the telemetry is converted into scientific data records and incorporated into space weather alerts and forecasts. Archive files are prepared daily and submitted immediately to the National Centers for Environmental Information (NCEI) where they have been archived since their inception in 1978. Our goal was to create flux maps of the POES energetic particle data that allow archive users to visually browse this archive. We attempted to balance spatial and temporal resolution against the constraint that each map represents a complete global view. We found that when accumulating the data into 2x2 degree bins that 210-260 orbits were needed to create a map of this sort. A single satellite can generate such a map in around 15 days; however, by combining data from 5 satellites only four days were needed to generate a complete global map. We use a sliding average to increase the timeliness of the multi-day maps. Electron fluxes are displayed at three energy integrals of > 30, > 100, and > 300 keV. Proton fluxes are displayed at several discreet energy intervals between 30 keV and 6900 keV in addition to a > 6900 keV integral. 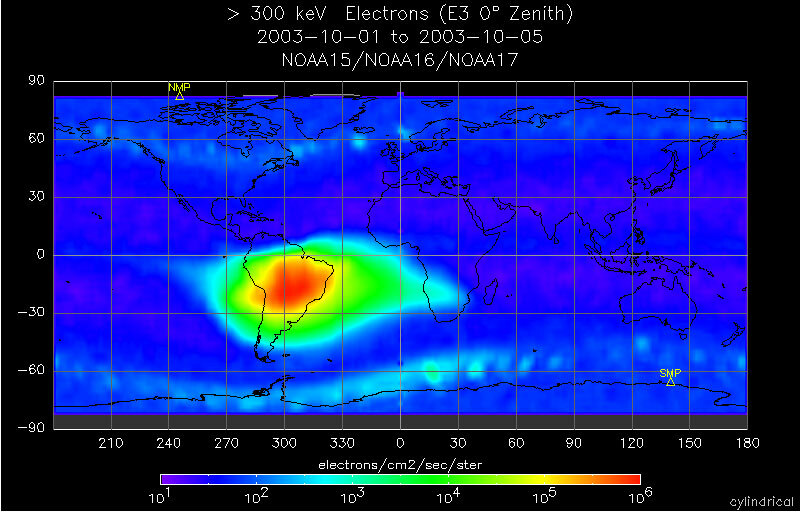 The resultant maps reveal the flux distribution of energetic electrons and protons present in the South Atlantic Anomaly and the “horns” of the radiation belts. Animated sequences of those maps illustrate the dynamic evolution of those populations during event intervals. Users should note that these maps are meant to provide a general overview of the POES energetic particle data. Cross contamination between proton and electron detectors can occur and these plots have not been corrected for this. For example, the > 6900 KeV proton (P6) plots in the bottom row can reflect significant contamination by relativistic electrons when they are present. Neutral particles can also appear in these data as a band of enhanced flux along the magnetic equator as seen in the 80-240 keV protons (P4) below. Also, no correction is made for the differences in sensitivity between SEM-2 instruments onboard the various satellites – data from each satellite is given equal weight in the averages. In addition, orbital banding will occur during intervals when the particle environment changes rapidly as compared to the length of the interval. Routine map production will include one sliding average map for each day for which SEM-2 data from POES are available -- July 1998 to the present. These static images will be used to produce movies for quickly browsing the entire archive and a sliding 54-day movie representing the most recent activity. Your comments and suggestions are invited. Aurora probability products by Ethan Peck: Invariant latitude & Magnetic Local Time (png), geographic coordinates (png), geographic monthly 1998 - 2008 (mpg).